Unfortunately, this week in the attempt to become more "pop culturally" aware, I promised my brother I'd watch something relating to his new UFC obsession, involving the extreme sport that I'm only familiar with from seeing Jon Favreau mindlessly attempt it on TV's Friends. However, the last time I watched anything having to do with wrestling aside from a certain film with Mickey Rourke was when it was the only way I could stop a group of neighborhood boys from screaming as an in-over-my-head teen babysitter. Although admittedly I never quite got the appeal of the overly theatrical sport that didn't seem to have the same sort of rules or discipline of boxing or kick-boxing, ever since the man formerly known as The Rock who now goes by Dwayne Johnson became a major movie star, it's been fascinating to see other WWE stars make the jump to feature films. On the surface, one would think that wrestlers would definitely have an advantage for acting over your average ball player, golfer, or figure skater with regard to amateur acting. Since what they do depends on their charisma and interplay they have with the audience, wrestlers may find the switch easier. However, the mediums are so different and film work is much less broad so that emoting well and striking just the right chord to sell a scene as an actual character proves to be a challenge for those who aren't supposed to let us into their internal world in the ring. And it's this challenge that Johnson initially struggled with but has finally mastered in his most recent films such as the delightful Disney father/daughter charmer The Game Plan and with a spirited turn in Get Smart opposite Steve Carrell and Anne Hathaway. Totally unfamiliar with John Cena the wrestler, a few years back I did check out The Marine when looking for a mindless action flick. And although it was a bit hokey and you could tell even without any research that it was his first feature, he had a definite appeal and boy-scout like ambition to just go-for-it that made us root for him. And it's this drive to push himself further to entertain and surpass what he's done that has only increased in the three years that followed for the release of his second and far superior film, 12 Rounds from the renowned action director Renny Harlin (Die Hard 2, Cliffhanger, Long Kiss Goodnight, Deep Blue Sea). Although as an actor, Cena still could use some work and perhaps a good coach when it comes to his more delicate and emotional scenes. 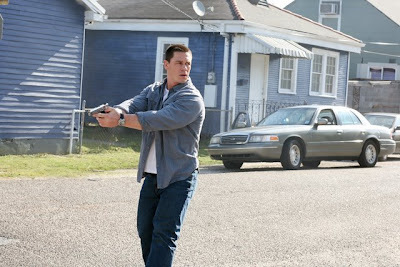 Despite this, he's improved from The Marine and this time, in surrounding himself with the best and the brightest-- John Cena has starred in the second sleeper "man on a mission to get his girl back" action movie of '09 so far. And incidentally I first saw the trailer for 12 Rounds while at the press screening of the other one in Taken. Admittedly, 12 Rounds is the B-movie since it's missing the brains of the A-movie Taken as well as the dynamite turn by Liam Neeson as well as an innovative approach in exploring the seediest side of Paris imaginable by way of dealing with an issue of international and timely significance. Yet, like its 20th Century Fox brother, Rounds, which was relegated to Fox Atomic and WWE for its production, knows it's an Arnold Schwarzenegger Commando-esque modeled formula picture given a zany Riddler style time limit gimmick twist. Moreover, the fact that Rounds comes from Fox couldn't be more fitting. 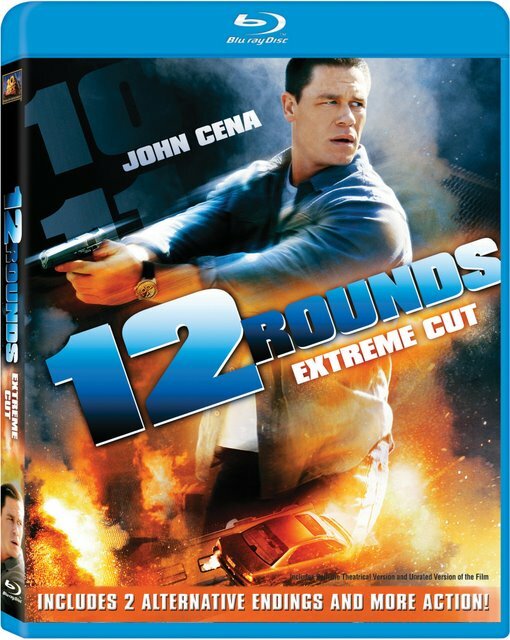 Essentially, 12 Rounds is a one-man version of the studio's superior Die Hard series combined with Speed throughout its running time and whereas Rounds director Harlin helmed Die Hard 2, Speed director Jan De Bont had been the cinematographer on Die Hard 1 so that all of its influences are tied together with Fox. 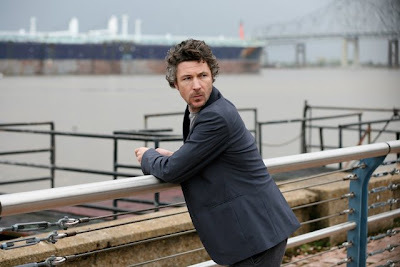 While it's not on the level of those pictures-- Rounds is a wholly successful popcorn movie that consistently tops itself as it finds Detective Danny Fisher (Cena) unwillingly pulled into twelve rounds of a game when his girlfriend (Ashley Scott) is kidnapped by a vengeance seeking Irish terrorist played the deliciously wicked Aidan Gillen. As long as you don't think too hard about the gaps in logic and just how much pre-planning would've had to go into something so ridiculously elaborate-- it's easy to get lured along with Fisher as he races from one round to the next in a series of increasingly dangerous and bizarre New Orleans set challenges to make it by the sound of the bell. Obviously since he's the puppet, Fisher doesn't realize that the man pulling the strings may have a grander scheme in the works that's larger than simply making him run from Point A to Point B. And when this begins to sink in as the movie careens towards its conclusion, the presentation of the mastermind's plan is deduced with illogical, rapid and far too much convenience as a sort of uneven "well, here's how we're going to justify three acts of insanity" succinct discussion. Yet in retrospect, it works in its own brainless right as yet another justification for an even bigger act of insanity in the inevitable showdown. When you couple complaints with lingering questions like, "well, how on Earth would he know that it would take..." you're left with plot-holes bigger than the fire trucks, streetcars and helicopters used throughout the movie, which most could use to shred it to pieces, let alone annoy the chess fans who will dislike the way it tries to aspire to the villain's chess-like precision in his battles. However, if you watch the movie in this manner, you'll miss out on what is one extraordinary live-action feast for thrill-junkies. And despite the fact that we live in an era of too much CGI and easily touched up green-screen effects, the Fox perfected Blu-ray for 12 Rounds is proof that-- as my mom is fond of saying-- "when done right, sometimes the bonus features can be just as good if not better than the movie." Featuring two versions of the film including the PG-13 theatrical take that nicely doesn't revel in the same carnage that the Die Hard films did as well as the unrated extreme cut-- the Blu-ray also boasts two alternate endings, commentary by Harlin, Cena and screenwriter Kunka. 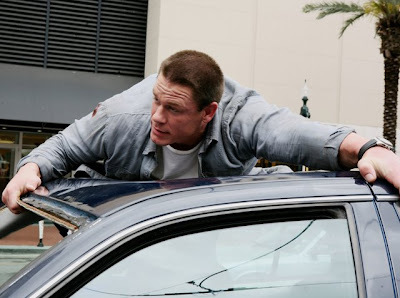 But the most dynamic extras are the overwhelming amount of behind-the-scenes featurettes that break down the action including some of the most dangerous stunts that amazingly were all done with Cena... and a few stuntmen here and there. While most new releases feel padded with typical press kit extras where the actors all talk about the movie as though they're making Gone With the Wind or Citizen Kane and praise each other as the next Cary Grant or Audrey Hepburn, every single extra included in 12 Rounds was completely riveting as a film fan who's growing weary of the endless amounts of CGI in movies. Moreover, the extras made me that much more willing to put up with some of the film's imperfections whether they were found in the structural stage or in Cena's struggles to hold his own opposite Gillen--all for the sake of one truly entertaining, switch-off-the-brain Blu-ray version of a theme park ride where it rattles up the hill fueled by steel, guts, and mechanics only to drop you with real effects as opposed to clicks of a mouse.